Hand drawn carnivorous plants in animal skulls to keep in your greenhouse for Collabor88. Each skull comes in bleached and a bit yellowed, with an insect eating plant potted in a hole cut in the cranium. 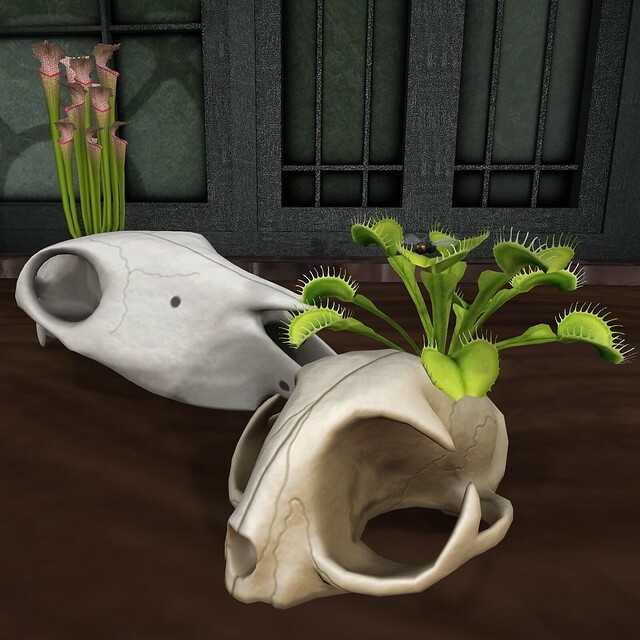 The Felis (cat) skull has a Dionaea muscipula (Venus flytrap- touch it and one of the traps will close! ), and the Equus (horse) skull has a Sarracenia leucophylla (white pitcher plant). Houseflies are included for feeding, so they can thrive. At this March round of Collabor88 until April 6. At The Coven this month, pentagrams made of bone, for raising the dead. There are two versions, with candles and with crystals. Both come with and without the center object, each candle or crystal can be changed to a selection of textures independently (there are also 5 texture options for the bones themselves), each candle can be lit/extinguished, and both also come with just the bones forming the pentagram. Each is 1 land impact. Also at The Coven, a free gift of a crystal heart for members of the (free!) The Coven+ group. 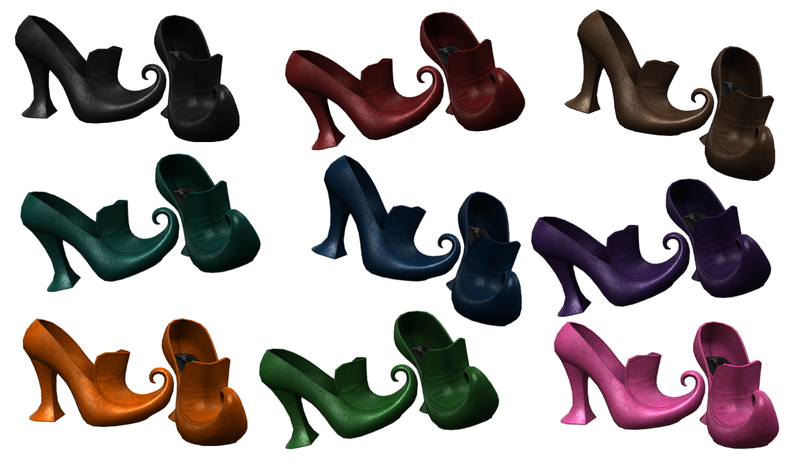 Assorted texture options and in two versions, standing on a valve and lying on its side, 1 land impact each. To be found at The Coven Necromancy, until November 26. 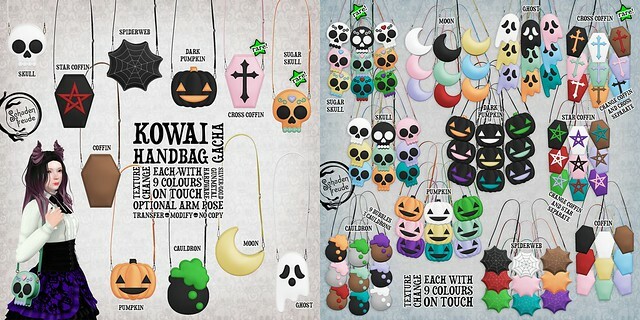 Cute and creepy handbags for SaNaRae! Each bag you win from the gacha can be changed on touch- arm pose on or off, hardware to gold, silver, or gunmetal, and 9 colour options (the cauldron has 3 for the cauldron and 9 for the bubbles, the coffins with cross and star change the coffin and the accent separately so you can mix and match all 9 to your desire). At this spooky round of SaNaRae! Mustela skulls at Season of the Witch, turned into jewelry and sitting on books. Mustela is the weasel/ferret/stoat/mink/badger family, and these skulls are texture change with 11 options (bleached, yellowed, dipped green/purple, dipped pink/purple, black, black/silver, black/gold, silver, gold, rosegold, rosegold/silver). The necklace is suspended by chains with 7 options chosen to go with the skulls. The skull on books is 1 land impact to sit on your desk. At Season of the Witch until November 4! For the month of October, in the woods of Salem, you can find an array of goodies, including this top. 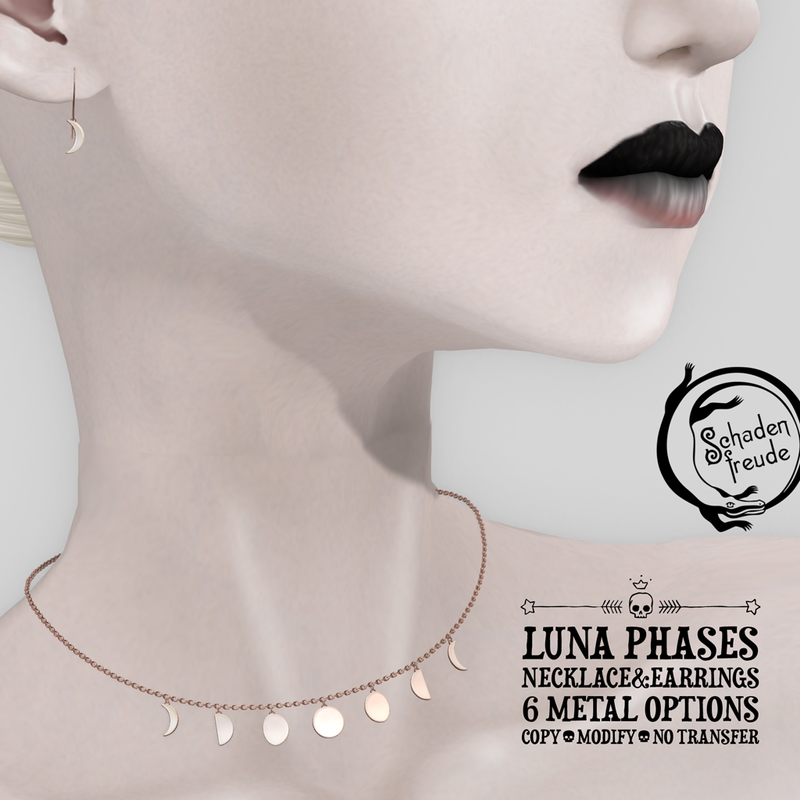 The Pentatank comes in 15 colours (so you can be a pastel witch too), and is fitted for Slink Physique Original and Hourglass, Maitreya Lara (note: experimental fit, make extra sure to demo! ), and Extra Small, Small, and Medium Standard Sizes. The front straps are optional and can be hidden- other sections can also be hidden for some more flexibility in wearing with other things. Find it at Salem this October! The Coven is all about the moon this month. My lunar festival offerings are a crystal ball, and some jewelry. 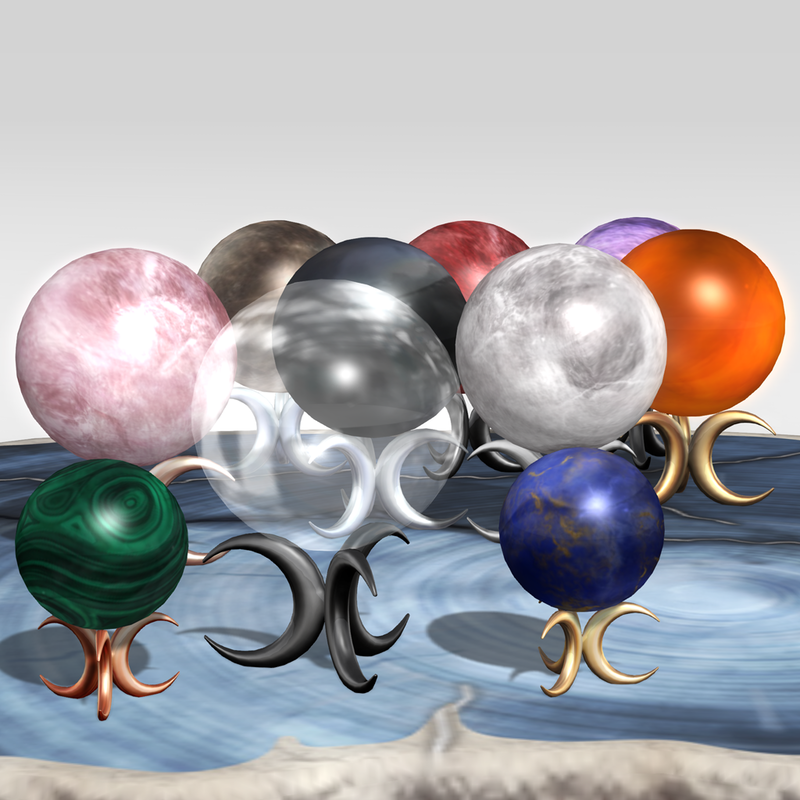 The crystal ballis texture change with 6 metal options for the stand (white-silver, silver, gold, rose gold, copper, and black), and 20 options for the ball (1 transparent glass and an assortment of stones). Each crystal ball is 1 Land Impact at the original size. 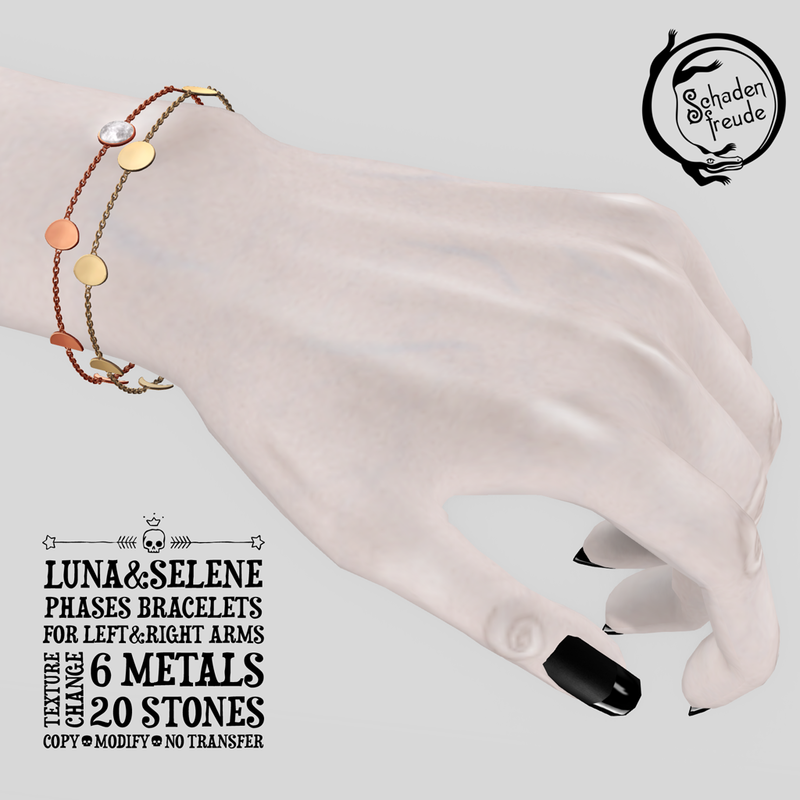 The jewelry has the same 6 metal options and when applicable, similar stone options to the crystal ball (instead of transparent glass, there's another red stone option). 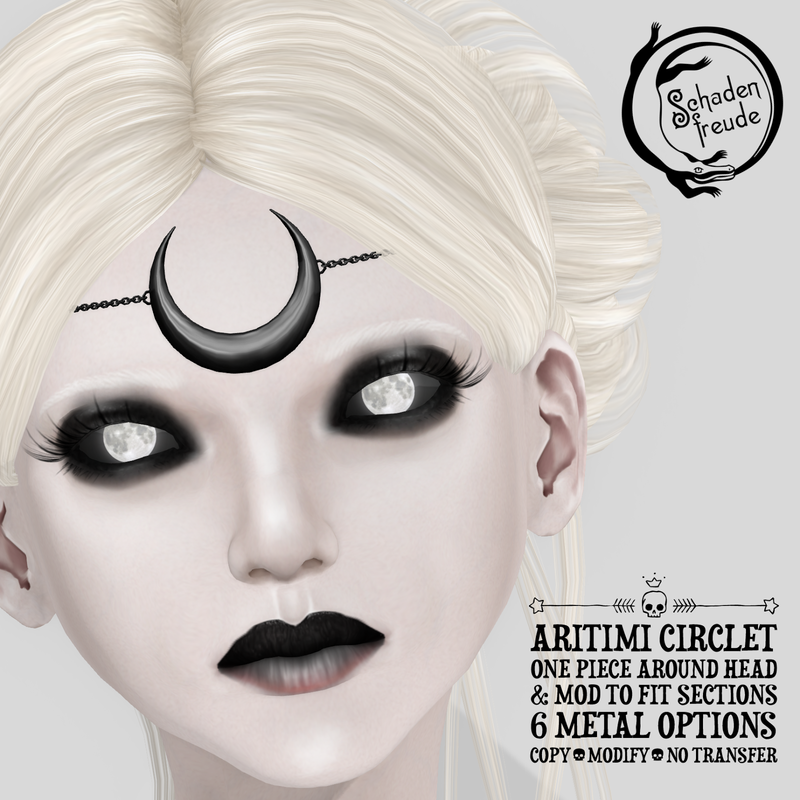 The Aritimi Circlet comes in 2 versions, one that is one piece all the way around the head to allow for easy stretching as necessary, and one that's just the front section meant to hide the back in hair, divided into three sections for more control over modifying to fit your head.